to catch bass especially in Florida. Bass fishing at night is nothing new, it dates back to the early days of artificial lure fishing. Although night bass fishing wasn't very popular then, and it gained some popularity in the pass years with advancements in gear and accessories. We mainly use topwater frogs, swimbaits, buzzbaits, worms or lizards although a spinnerbait works well with a little wind. Most anglers will tell you that if you want the greatest experience in night bass fishing, you must use topwater to fish. Having a bass blow up on your topwater lure is, indeed a thrilling experience at anytime day or night. But it is especially good when it happens at night when you can hear your lure working and blindly feel the explosions of the topwater strike. And never see a single thing happen...this is night bass fishing at it's best! Some anglers have set ways for night fishing, so much so that many of them have become too set in their ways to try anything different. Actually, the arsenal we use for bass fishing at night is no different from what you use during the day. That's because bass pray the same waters day or night, and very similar lures are used depending upon the type of water you're fishing. The Jitterbug is one of the all time favorites for night bass fishing because it causes such a ruckus and can be stopped periodically, a modern-day floating frog can give that same noise and action by simply adding a few glass rattles inside the lure. Both of these actions often draws a response from even the most timid large-mouth at night. Summertime is by far the most popular time of the year for bass fishing at night, and there are several reasons why. For one, bass are caught fairly regularly at night during the hot weather months. Secondly, the temperatures are cooler at night than they are during the day, and thirdly it provides a great escape from the daytime crowds. A full moon isn't a must for night fishing, but it helps greatly. Bass tend to feed more during a full moon than they do when there is no or little moon. Also, any moonlight at all will help you see to cast. If you have never tried Night bass fishing but plan to do so, add it to your bucket list. In general, you want to use heavier tackle especially at night. The effective on your equipment during the daytime in clear-water lakes it completely different at night. When fishing at night it's easier to "feel" a heavier lure a than a light one, and it's easier to hook and land a big fish at night using stouter equipment. In a place like Florida, that possibility of a 10+ lb bass can come at any time and the gear needs to withstand the fight at night. For submersible lures like most lures when night fishing, dark colors have proven over time to be very effective. Topwater lure colors are about the same, black is the favorite choice of anglers in most situations as it provides the most contrast to a fish looking upward into the moon light. The most common technique of lure retrieval is on top, the speed should very from just fast enough to keep it up top to buzzing almost as fast as you can. Find the way they like it and then be consistent with your retrieve speed for most action. It will take even the best angler a little while to adjust to hearing the action and not seeing it resulting in missed strikes. Topwater lures, buzz baits, swim-baits and frogs. 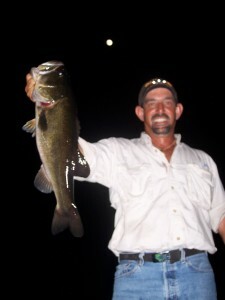 What's the best locations to fish at night is a question asked by many Florida bass anglers. First you need to know, fishing at night is close to day time fishing. But not always the same places you catch fish earlier in the day. If you had a good of fishing in your favorite canal or pond during the day, fish the same spots. Look for textured banks, consisting of rocks or gravel. Boat docks or mud slides. Because of the warms temperatures in Florida night fishing is done eight months out of the year. While many will write the high temperatures during the day are the reason to fish at night, we will argue moon phase is much more important. Because the bodies of water in Florida are shallower than to the rest of the country, the bass are much more effected by the moon phase. So next time the bass quit hitting during the daytime and you want to blame it on the heat...stop and look at the moon phase. It will be either the week of the full moon or even worst the week following a full moon. These are the tell-tales that it's time to start night fishing or at least later in the day. The accessories for Florida bass anglers is what really makes it possible. The use of "hat lights" when night fishing are a must for retying and spotting shoreline for your next cast. Lures with more "feel" such as spinner-baits and buzz-baits fish easily at night with or without a hat light. In Florida a long sleeve shirt, "cotton" as the bugs don't like it as much is almost required for protection against the bugs. With no wind, you will need a "bug" zapper and/or use heavy D.E.T. bug repellent. You should consider limiting the number of rods and tackle you bring to avoid tangles and damaging equipment. Single-hook lures are considerably safer to use at night, but treble style hooks will help to hook more fish as your reaction times are not as good at night. Lastly, while the hat lights help when fishing, they do hinder your sight while driving. With a big moon consider turning of all extra lights and let your eyes adjust, most times your navigational will be easier this way. Although, if traveling any length of time at normal running speeds. A high powered spot light recommended, as it will provide additional distance to your ability to see ahead of you.